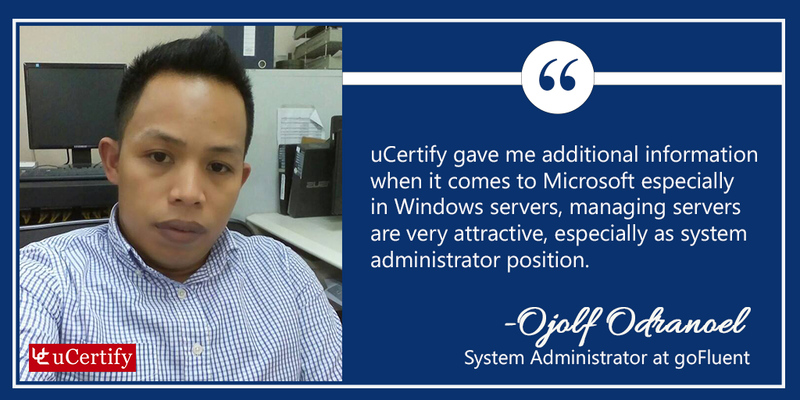 “uCertify Microsoft MCSA: 70-410 gave me additional information when it comes to Microsoft especially in Windows servers,Managing servers are very attractive,especially as system administrator position. uCertify is one of the best websites to prepare for the IT certification. I checked out their Microsoft MCSA: 70-410 and had a great experience, it is a very powerful, interactive learning platform. We are working on all the areas of improvement mentioned by him to provide a better user-experience. You can check out the complete post on a Mr. Ojolf Odranoel Linkedin profile or by clicking here. To know more about Mr. Ojolf Odranoel you can contact him via his Linkedin profile.